If you’ve been noticing any of these problems in and around your home, contact Atlas Piers of Atlanta. When water builds up around the foundation of your Decatur business, pressure is exerted on the walls of your foundation. If you have poorly compacted or loose soil around your foundation and pressure from water, it can cause the walls of your foundation to bow in or lean. These walls can eventually crack and that allows water to seep in and cause a wet, moldy, mess. We can help with this at Atlas Piers of Atlanta. To shore the walls up, we can use wall anchors or other underpinning products or carbon fiber repair. This will add the strength needed to permanently support your walls. We can work on your commercial properties in Decatur. Decatur is home to a lot of industrial buildings and small businesses. We can help with all kinds of issues in both areas. We do new construction piering to add support during commercial new construction projects. We can provide all your commercial foundation repair Decatur Alabama needs. Other services that we offer include crawlspace encapsulation and repair.Many times, a foundation problem can affect the structural integrity of your crawlspace. If this is the case in your home, invest in underpinning services to keep the crawlspace supported and stable. A damp crawlspace can also lead to several major issues, including high humidity, mold growth, wood rot, rust on metal, and wet or damp insulation. 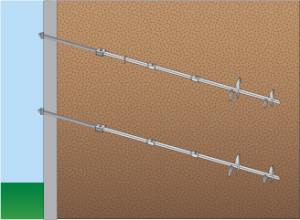 Crawlspace moisture issues can be solved by installing a vapor barrier along the walls of the crawlspace to seal out moisture. This process is called wall encapsulation, and helps to keep the crawlspace dry and safe. So for all your commercial foundation repair Decatur Alabama projects, count on the professional team at Atlas Piers of Atlanta. We have solutions for all your problems, and will find the right one for your budget. We have years of experience in underpinning, pressure grouting, and more. Call today!